Being a journalist has never been easy. Many of them work long hours, travel to faraway places and go through plenty of mud just to get a story. Being a journalist in Southeast Asia however, requires an even stronger character. While the rest of the world might lament that the social media fuelled media landscape helps conceive fake news, many journalists in the region are being locked up for merely reporting the truth. In many parts of Southeast Asia, journalists risk life and liberty while carrying out their duties. “Media is under increasing threat across Southeast Asia. It is abhorrent that brave journalists should have to put their personal freedom or even lives on the line when they are simply trying to do their jobs,” said APHR Board Member Teddy Baguilat, a member of the Philippines House of Representatives. In the Philippines, it is just not drug-related criminals who face the risk of death, even journalists fall under the same threat. Based on a recent journalist death tally report by the International Press Institute (IPI), Philippines is the most dangerous country in Southeast Asia for journalists. Reports show that 177 journalists and media workers have been killed there since 1986; 47 alone in the past decade. This places the Philippines among the five states in the world with the poorest accountability records, according to the Committee to Protect Journalists (CPJ). The other four states are Somalia, Syria, Iraq and South Sudan. The Philippines is also where the 2009 “Maguindanao massacre” happened. The incident involved a convoy of six vehicles carrying journalists, lawyers, and relatives of Vice Mayor Mangudadatu that was attacked by 100 armed men. The incident left 58 casualties, with at least 34 of them journalists. To date, no one has been held accountable. In a recent incident, Filipino journalist Dennis Denora was killed in a drive-by shooting by gunmen while driving his car through Panabo City, Davao del Norte on 7 June. While President Rodrigo Duterte established a Task Force on Media Security in 2016, he has not exactly been kind to the media either. The Philippines government launched a tax evasion and libel investigation on Rappler, a media organisation known for criticising Duterte’s administration. Other parts of the region are not safe either. In Cambodia, at least 13 journalists have been murdered since 1994, many of whom were investigating and reporting on allegations of corruption by high-level individuals in the government and military. In Thailand, 10 journalists have been killed since 1998. Threats against journalists are not just limited to killings, but also include various repressive measures that governments have taken to silence them. The CPJ has singled out Vietnam as one of the worst offenders, as at least 16 journalists and bloggers have been jailed there since 2016. In Myanmar, two Reuters journalists - Wa Lone and Kyaw Soe Oo – were sentenced to seven years in jail in September this year for violating the archaic Official Secrets Act. Their only “crime” was helping to uncover a massacre of Rohingya villagers by Myanmar’s security forces. As it stands, the entire region’s record on press freedom is abysmal. 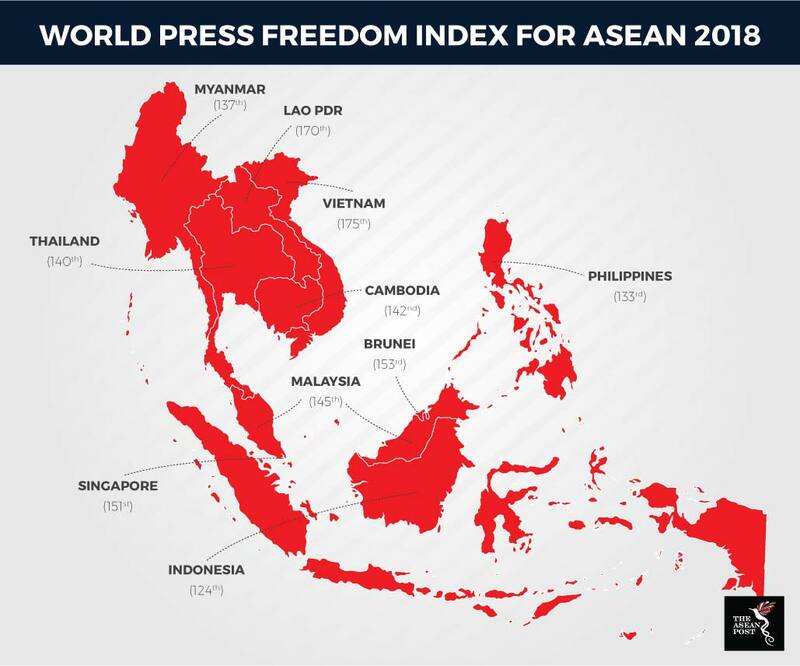 Every ASEAN country is currently ranked above 120th place out of 180 countries in the World Press Freedom Index. Indonesia is ranked highest among ASEAN countries in the index at 124th place while Vietnam is the lowest in the region at 175th place. Other countries such as Malaysia and Singapore stand at 145th and 151st, respectively. With something as basic as press freedoms not guaranteed for journalists, it is no surprise that when journalists are killed, no one is held accountable. “Governments must do much more to protect journalists and ensure that those responsible for killing media workers are brought to justice. Anything less will simply send a signal that such crimes are acceptable,” said Baguilat.